He was born Ivan Sergeyevich Turgenev in October 1818 into comfortable family circumstances but his childhood was fraught with difficulties. His mother Varvara was a wealthy heiress who suffered from her Army husband’s constant infidelities and but she was widowed when Ivan was sixteen years old. She was a cruel mother who would beat her children at will. Despite this he had a good, “gentleman’s” education culminating in a year of study at the University of Moscow and then three years reading the Classics, philology and Russian Literature at the University of Saint Petersburg. Further studies in philosophy and history were taken in Berlin and then he took a masters’ degree. 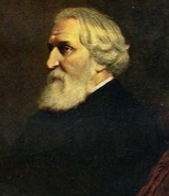 Turgenev had gained an early interest in poetry from the verses read to him as a child by a family servant and he, in turn, was inspired to write his own poetry as he became a young man which was well received by literary critics such as Vissarion Belinsky. Spending time in Germany influenced him greatly and he hoped that his own country could benefit from the Age of Enlightenment which was sweeping across most of western Europe. Russia was still heavily in favour of serfdom and Turgenev, along with many other educated young people, were very much against it. He joined the Ministry of Interior as a civil servant in 1843, serving for two years and probably hoping to change things for the better. However, Russian life seemed to stifle him and he spent much of his life living in Paris and Baden-Baden. He was close friends with the French author Gustave Flaubert and they shared political views in that neither favoured the extremist right or left wing politics that seemed to permeate most of Europe. Another close French relationship was conducted with an opera singer called Pauline Viardot. 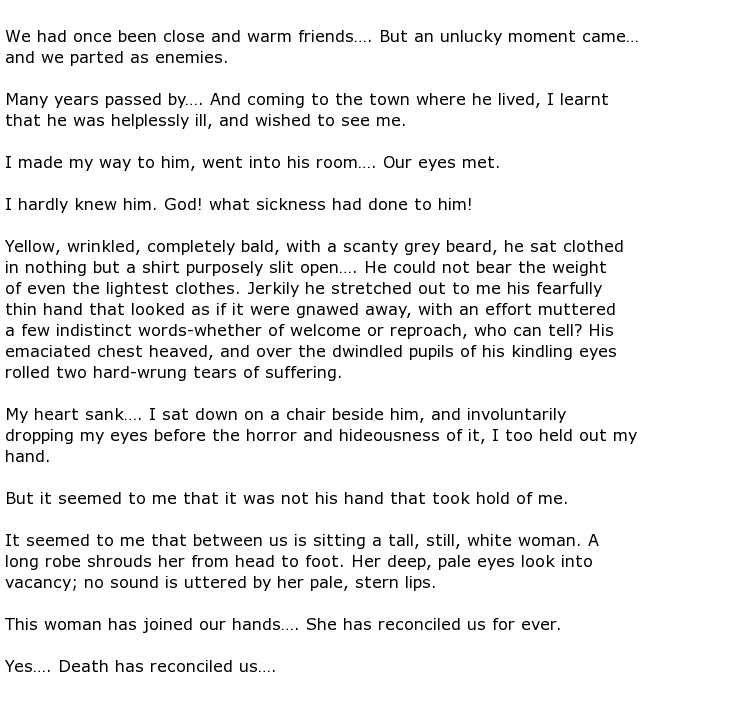 Ivan Turgenev died on the 3rd September 1883 of a spinal tumour at the age of 64. Although he was near Paris at the time his remains were taken back to Russia and interred in a St Petersburg cemetery.